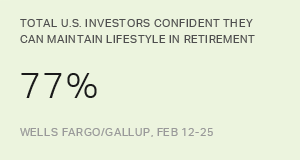 WASHINGTON, D.C. -- Stock funds dominate investors' perceptions of the best long-term investment they can have, according to the latest Wells Fargo/Gallup Investor and Retirement Optimism survey. Fifty-four percent of investors choose stock funds -- defined as index funds, mutual funds and ETFs -- as the best investment option for the long haul. Real estate investments aside from a primary home receive the next-most mentions, at 19%, followed by individual stocks (11%), gold (6%) and savings accounts or CDs (6%). Bonds rank last at 4%. Which of the following do you think is the best long-term investment considering a time horizon of 10 years or more? Retired and non-retired investors have broadly similar perceptions of what makes the best long-term investment, defined in the survey as a time horizon of 10 years or more. Stock funds top both groups' lists, while savings accounts, gold and bonds rank at the bottom. However, the groups have different views about the growth potential of individual stocks and real estate. By 17% to 8%, retirees are more likely than nonretirees to name individual stocks as the best long-term investment. 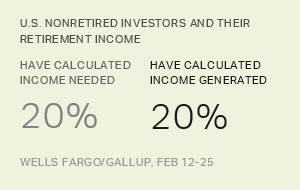 By 22% to 13%, nonretirees put more emphasis than retirees on real estate investments. Investors with more than $100,000 in their investment portfolio are more likely than those with less than $100,000 to believe stock funds are the best investment, by 58% to 46%. Those in the lower asset group (14%) are more likely than those in the higher asset group (3%) to believe savings accounts or CDs are best. These results are from the second-quarter Wells Fargo/Gallup Investor and Retirement Optimism Index survey, conducted by web using the Gallup Panel from May 7-14, 2018. The poll is based on U.S. adults with $10,000 or more invested in stocks, bonds or mutual funds, either within or outside a retirement savings account. The combined 65% of investors choosing either stock funds or individual stocks in the May survey corresponds with stocks' dominance in investors' portfolios. Eighty-six percent of those surveyed report having money invested in stock funds and 61% in individual stocks. The only other financial product investors report using as widely is savings accounts or CDs, with 80% saying they have one of these. Nearly half of investors, 48%, indicate they own bonds. Three in 10 report having real estate investments other than a primary home and 11% invest in gold. Do you currently have money invested in each of the following, or not? Investors with larger portfolios -- $100,000 or more in investments -- are more likely than those with less than $100,000 to say they use all of the different investment options measured except for savings accounts/CDs. The gap is particularly wide for bonds (owned by 58% of higher asset investors vs. 22% of lower asset investors) and individual stocks (69% vs. 42%). There are also notable differences in investors' use of bonds and individual stocks according to their retirement status, with retirees more likely than nonretirees to use each. An additional question on the survey probed investors about different types of real estate investments, asking whether owning one's own home, owning rental property or owning real estate investment stocks (REITs) or mutual funds offers average Americans the best rate of return over the long term. Home ownership leads the list, chosen by 57% of investors, followed by owning rental property (28%) and real estate stocks/mutual funds (15%). Retirees are more likely than nonretirees (66% vs. 52%, respectively) to think home ownership offers people the best long-term return, while nonretirees show higher confidence in owning rental property (33% vs. 18%). Investors with $100,000 or more invested are more likely than those with less invested to think home ownership is best, while they are less likely to choose rental property. Investors have important decisions to make when it comes to investing for retirement or other long-term goals, as the rate of return they achieve will make all the difference in building wealth. The majority of investors believe stock funds offer average investors the best prospects for long-term growth, far outweighing those identifying individual stock investments. Although different stock funds vary in how they perform, investors may believe it is generally safer to rely on experts or computer algorithms, including indexing, to select stocks rather than one's own knowledge. They may also recognize that many stock funds offer a degree of diversification. Whatever the reason, more investors report having money invested in stock market funds than individual stocks, and given their perceptions about growth potential, the current data suggests that pattern is here to stay. 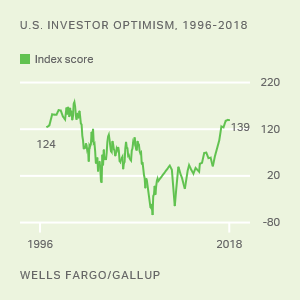 The results of this Wells Fargo/Gallup Investor and Retirement Optimism Index are based on a Gallup Panel web study completed by 1,921 U.S. investors, aged 18 and older, from May 7-14, 2018. The Gallup Panel is a probability-based longitudinal panel of U.S. adults. Gallup recruits panelists using random-digit-dial phone interviews that cover landline and cellphones, as well as using address-based sampling methods. The Gallup Panel is not an opt-in panel. The sample for this study was weighted to be demographically representative of the U.S. adult population, using the most recent Current Population Survey figures. For results based on this sample, one can say that the maximum margin of sampling error is ±5.4 percentage points at the 95 percent confidence level. Margins of error are higher for subsamples. In addition to sampling error, question wording and practical difficulties in conducting surveys can introduce error and bias into the findings of public opinion polls.